and Angler magazine. Plus we still had a very successful marketing company and a client list to maintain, and we did most of the trail’s sponsorships. That year sponsors included Fountain, Mercury, Sea Ray Laguna, Ranger Boats, and fifteen other companies. Thanks also must be given to the membership who started buying the sponsors’ products. Joe Bruce ended the year on a very impressive note. 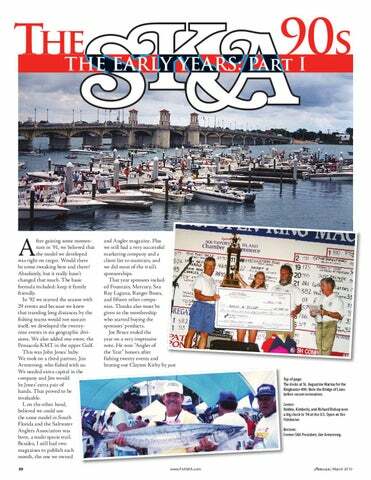 He won “Angler of the Year” honors after fishing twenty events and beating out Clayton Kirby i by by just Top of page: The docks at St. Augustine Marina for the Kingbuster 400. Note the Bridge of Lions before recent restoration. Center: Robbie, Kimberly, and Richard Bishop won a big check in ’94 at the U.S. Open on the Fishbuster. Bottom: Former SKA President, Jim Armstrong. 2.59 pounds. Joe is still around, going strong, however he only fishes a couple of events a year. He has promised to be at the Nationals this year for the big anniversary show. Brian Henry on Mr. Magoo won Division Two, Sammy Session fished Shooting Star II to a Division 3 win, and Klaus Schoenfeld earned top honors in Division 4 fishing his Fishing Machine. In Division 1 it was Richard Forbis while Wayne Conn earned the number one slot in Division 5. Steve Ennis topped the list in 6. David Simms caught the largest king of the year in Pensacola, a 60.78 while Bruce set a record in Georgia in the Fernandina Beach tournament with a 53.80. That record held until 2009. Chandra Kirby, Clayton’s sister, was the Top Overall Lady Angler, Clayton’s son won Topp Junior, and Lonnie Broadwell was our Top Senior. It was a great season with the membership ranks quadruupling over ’91. But it wasn’t over. We had elected early in the year to host st a National Championship howwever it wasn’t to be held till thee spring of ’93 in Treasure Island, d, Florida. It was fitting that thee very people who believed in uss and gave us our first sanction in ’91 in Swansboro, North Carolina became our first earned National Champions. Jim Davis, Barry and Todd Matthews, and Garland and Brad Sewell won the event for Mercury and Fountain, with a two fish aggregate of 56.38 pounds. It was awesome. It was also a beginning for branded teams. Alex Leva secured several slips and had all the Hydra Sports owners tie up together. It was the beginning of a very serious trend! Wayne Conn, Randy Spainhour, the Broadwell family, and Rick Smith rounded out the top five in the Championship. Top: Brian Hasson accepting his Junior Angler honors. Center Left: The crowd at the Kingbuster 400. Center Right: Mercury’s Dan Schaad with Amy Kidney and Jim Armstrong. Right: Randy Spainhour with Amy Kidney. Bottom: Randy Keys, Ira Pearson, and Jimmy Hasson were National Champions in ’95. Top of page: A young Field Hucks at the Championship. Bottom Left: Ranger’s Doug Babbs. Bottom Right: Mamie Mason and one of her Top Lady Angler honors. Top Left: Loadmaster’s Ben and Linda Worthy. Top Right: Jack Holmes, Mercury’s Gar Bremer with Angler of the Year winner Dave Workman. Center Left: Danny Wallen “Dan-O” accepted an award. Above: Ranger’s Doug Babbs with Klaus and Christine Schonfeld. Right: Jim Armstrong, Terry Grantham, Amy Kidney, and Joel Coker. 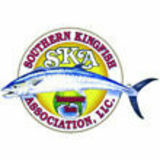 The second article in a series about the history of the Southern Kingfish Association.